The Samsung Ecobubble washing machine (WW70K5410UW) is a great concept in the way it saves the environment and the pennies in your pocket. 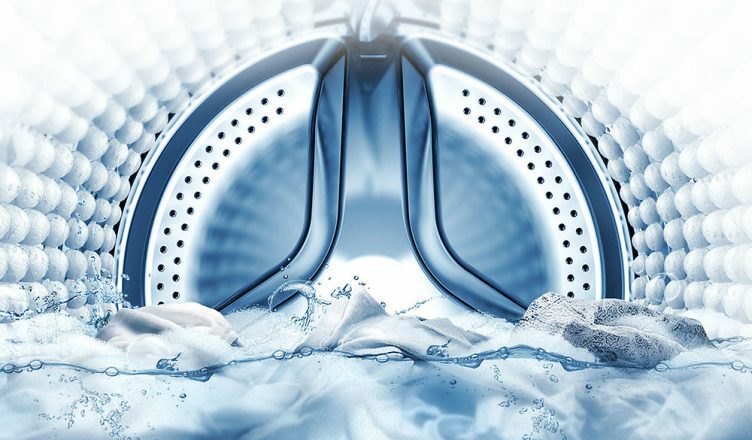 Put simply, the Ecobubble system works by injecting air into the detergent. Once this happens, the process leads to a more powerful uplifting of dirt and stains, to leave even the messiest of children in sparkling clean clothes again. The “ecobubbles” pack a powerful kick but are still gentle on fabric – working to remove dirt and stains quicker when penetrating the material of the garments. This also causes the ecobubbles to be dispersed into the drum more evenly allowing for a more intensive wash.
Another added benefit of choosing this appliance is the handy ‘AddWash’ feature which comes in the form of a little hatch on the door of the washing machine. This enables the user to slip small garments into the machine after a programme has already begun. This can be extremely handy for those pesky stray socks that always get away from you when you’re loading the washing machine and, more importantly, does not hinder the wash cycle. However, you should note that you can also add anything to a washing machine after it’s started by pausing the machine. Add Wash is a great feature but, due to safety considerations, it won’t allow you to open the hatch if the machine is up to 50 degrees in temperature. The Inverter Motor is a brilliant component and is effectively a form of power management for the drum rotation when performing a wash cycle. The inverter motor works by monitoring the power input required for the optimal performance. It then only allows the necessary amount of energy for what is required on that specific cycle. It also helps to give the motor a longer life span due to less of a strain than that of a conventional washing machine motor. Samsung provide a specific 10-year guarantee on the inverter motor itself. The Samsung Ecobubble has a standard, two-year parts and labour guarantee, but at the time of writing you can also get an extra three-years via redemption with Samsung on their website. So now we know how it works, what programmes does it offer? The Ecobubble model has a total of 14 different wash programmes which include the following: a Daily Wash which is 62 minutes long and is pre-set to a 1200 spin-speed; a Pre-Wash Cycle; a Wool Cycle which is pre-set to 54 minutes long and an 800 spin and a Delicate Cycle which is pre-set to 36 minutes long and set to a 400 spin speed. The commonly found Cotton Cycle on this model will automatically adjust the time of the wash by weighing the load. There are also programmes for Synthetics, Intensive Washes, Colour Washes, an Anti-Stain Cycle, Easy Iron, Outdoor Cycles and a Baby Wear mode that runs for 2 hours and 26 minutes and is pre-set to 95 degrees. The average wash time is 245 minutes, which is common due to the more energy efficient cycles on most modern washing machines. You can add a 30-minute bubble soak to the Cotton, Synthetic and Baby Cycles, as the little ecobubbles will help loosen the toughest of stains. The Stay Clean Drawer does what it says on the tin. Principally, it is more of an efficient transfer of the detergent from the drawer to the drum. Any residue detergent that is left behind is vanished by the powerful water jets within the drawer cavity causing it to dislodge and disperse away into the drum. The drum itself has a special diamond pattern embellishment that is designed to push the clothes away from the edge of the drum and prevent plucking thus taking better care of the more delicate fabrics during spin cycles. The diamond shaped indents collate water during the spin process and slow the pace of water as it drains away. This helps stop things like threads and zips snagging and ripping fabric because of the cushioning effect of the water between the clothes and the drum. 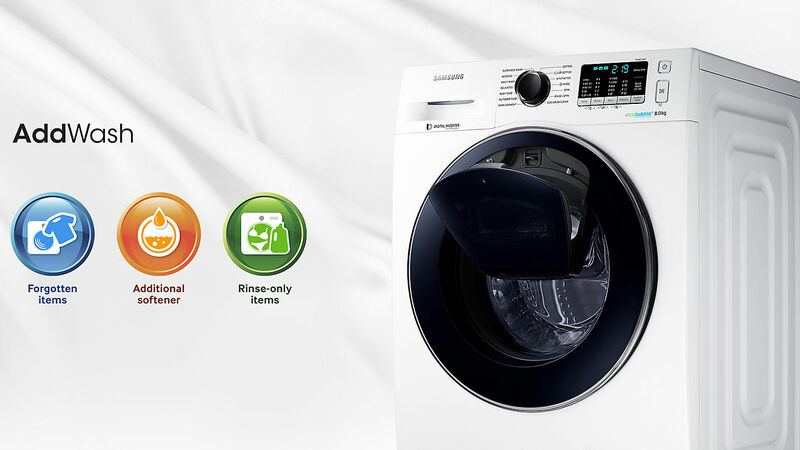 Customers will be pleased to note that the Samsung eco-bubble washing machine incorporates an easy to use troubleshooting system aided by the users interaction with a mobile phone app. This is alongside an automatic error monitoring system that will detect and diagnose problems in the early stages within the machine itself. By using the free to download smartphone app by Samsung, this feature should provide quick and easy troubleshooting solutions for basic issues without the need to call an engineer or spending ages on the phone to a help desk. In summary, this machine is ideal for families and busy households due to its extensive list of comprehensive programmes and handy addwash features. The energy conscious will be pleased by its economy and those that just want peace of mind in its reliability will be reassured by the generous manufacturer guarantees that the eco-bubble offers. For more information why not pop into your nearest Hughes store for a chat with our knowledgeable team members, buy online or use our stellar click and collect service to pick up your new machine within one hour of purchase.